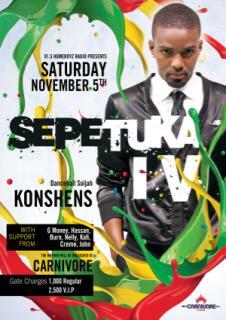 New York, NY – (November 3, 2011) – Konshens continues to make his mark across the world as he headlines the upcoming event Septuka IV, on Saturday, November 5. in Kenya. Coming off a successful seven weeks European tour Konshens is now in Kenya where he is giving thanks for the opportunity.
" I am happy to know say I am given the opportunity to travel to our homeland of Africa and perform for my many fans live. I get request on twitter and facebook, everyday asking when am I coming to Kenya and to be giving this opportunity is a great honor". The event planners for Septuka, selects an artist from Jamaica every year, who has made an impact in the music industry. This year it was easy for them to make a selection, as Konshens has received emourmous airplay and increase in fans across Kenya over the past year. Upon his return from Africa, Konshens will begin promotions for his debut album "Mental Maintenance" set to release February 2012.